While visiting upstate NY this past weekend, the sure signs of Autumn were evident in the blooming goldenrod and the ripe grapes on the vines. The Chancellor grapes hanging on the vines at the Thirsty Owl winery made a beautiful image against the sky on a beautiful Sunday afternoon. It had been an idyllic morning and a means to get away from the trials of life for a bit and do something that brings joy to both of us. Wine tasting is both fun and educational. I always learn something new every time I visit a winery. 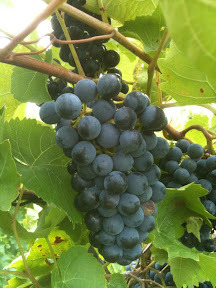 Sometimes I have this irrational dream of owning a vineyard--that is farming after all. Imagine me, a farmer? Probably not, but it is fun to think of tending the vines and and enjoying the wines produced by the grapes from the land. 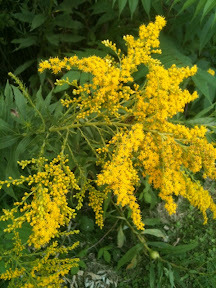 The golden rod is also in bloom. And that of course means that the allergy season is ramping up with the autumnal allergens. All too soon, the trees will don their autumn colors and closeout the seasons and begin the transition into the dark times. But despite that, it was an interesting weekend of grapes and goldenrod and family.